For nearly 150 years, our church has strived for a simple yet unfinished goal: to bring glory to God by making disciples of men and women from the village of Harrold, proclaiming that Jesus Christ came into the world to save sinners by dying on the cross, suffering in our place to bring us to God. While traditions have varied over the years, the present-day church shares with her forebears the mission to call people to turn from sin and trust in Christ, for forgiveness, peace and eternal security. The beginnings of the church in Harrold can be traced to early winter 1875, when gospel services were first held in the club room of the former “Old George Inn” public house, which was pulled down and the current building erected in its place. Taking an overview, there are three landmarks which defined the development of the church; inauguration, handover to The Evangelisation Society, and amalgamation with the Carlton Baptist Meeting. The story is told in three parts corresponding to the three names that the church has had. To navigate to an individual section, please use the links below. You can find a list of pastors at the bottom of the page. The first gatherings in 1875 were the result of three months’ gospel mission initiated by Miss Mary Anne St. Quintin. She was a single lady of noble descent, well known in the village for her philanthropic endeavours and as a public advocate of temperance (total abstinence). Roughly a decade before the first meetings, she established the village Temperance Society and Band of Hope as she was concerned for the welfare and morality of the villagers. She then purchased the “Old George Inn” public house at the centre of the village, which she converted to a “British Workmans” (a public house without alcoholic drinks) renamed as the “Temperance Hotel”¹. The mission itself was run by Mr and Mrs John C. Croxford from nearby Bedford, and comprised Sunday evening services with gospel preaching, weekly prayer meetings and a weekday night school. The attendance grew so large that the organisers decided that the premises could not accommodate the same numbers in the next year’s campaign. Thus, during the winter of 1875, Miss St. Quintin offered to demolish the “British Workmans” and in its place build a “Mission Hall” for the formation of a church to continue the work, on the sole provision that the Croxfords take up residence in Harrold. The offer was accepted, and for the intervening months while works were underway, the congregation met in the spacious stables at the rear of the inn. Construction was finished by end of October 1876, and the building where the church still meets today was opened for public worship at 6pm on Sunday 2nd December 1876, with the inaugural sermon given by Mr Croxford on Luke 19:10 – “The Son of Man is come to seek and to save that which was lost.” As far as is known, the original building consisted of the front porch, the main hall and sanctuary with pulpit, a reading / study room and facilities at the rear. Miss St. Quintin’s residence was next door, no. 80, which is still known today as ‘Quintin House’. Through the generosity of this lady, the ownership of the hall was vested in trustees for posterity. The church was not affiliated to a denomination, to be run on ‘non-sectarian’ lines. From then on the church thrived, with two or three regular meetings on Sunday, open-air meetings on the village green, Bible classes, mothers’ meetings and a flourishing Night School for young men. A Mutual Improvement Society for young men was formed the following year in 1877, with a meeting held weekly on Tuesday evenings². A reading room / library was opened at the back in 1878-90. The hall thus became an important part of village life, as the home of the Temperance Society, the Band of Hope, with regular parades, fetes, public teas and annual demonstrations attended by noted Temperance speakers from across the country. At the time of Miss St. Quintin’s death in July 1896, the church was able to record a considerable membership³. Mr Croxford continued as church Pastor and President of the Temperance Society until his retirement at the end of September 19134. The Croxfords were succeeded by Mr and Mrs George H. Way of Southsea, who initially took up residence at Fairview cottages. 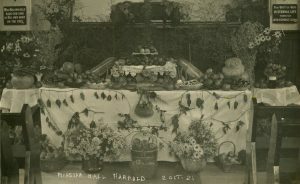 Annual Harvest Suppers and other outreach events continued, while overshadowed by the Great War which brought many difficulties into village and church life. During this period, a small house with surrounding garden was built and annexed to the Hall, thus creating a private residence separate from the Hall. 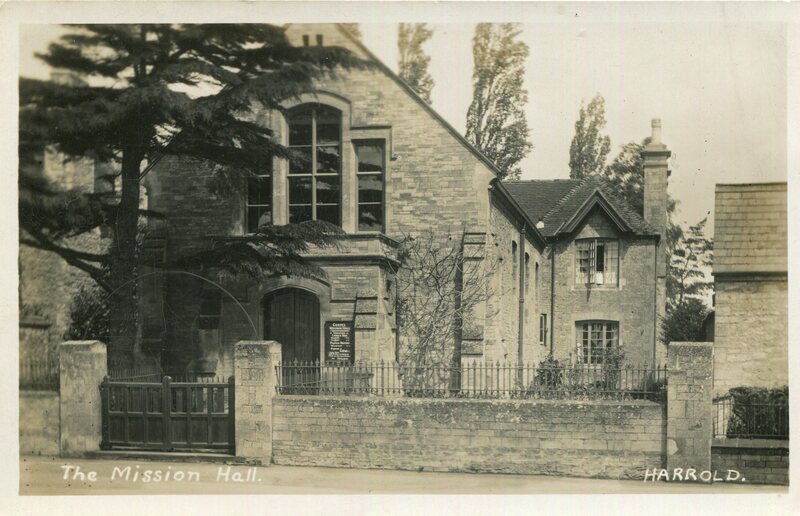 By 1920, Pastor Way had taken up residence in the aptly named ‘Mission Hall house’5. When Mr Way indicated his intention to retire, the trustees Col. Arthur Newton St. Quintin and J. C. St. Quintin (nephews of Miss St. Quintin) decided that the time had come to commit oversight of the work to an external missionary organisation. On 24th September 1931, the trusteeship was formally transferred to The Evangelisation Society (TES), and in May 1932 Albert H. B. Edmunds (from Dagenham, Essex) took over as the resident evangelist. Under the auspices of the Society, the church’s evangelistic endeavours were reinvigorated. A weekly ‘Bright Hour’ for women was begun with an initial membership of more than 40 people. Evangelistic campaigns were boosted by itinerant Society missioners from London, who after hosting a gospel service in the hall would lead the congregation to witness to villagers in the nearby public houses. Hundreds would come to the Harvest Suppers. Deputations were also held by missionary organisations such as the London City Mission and Open Air Mission. During the pastorates of Mr Edmunds, Mr Smith and Mr Sims, the church continued to be known as ‘Mission Hall’. At the request of TES, Sidney Sims (resident evangelist during the 1950s) opened a Sunday School at the Hall which was greatly blessed by God with large numbers of children attending from Harrold and neighbouring villages. In the late 1950s the church decided to rename from Mission Hall to Evangelical Church, both because the former was felt to be out of date, and to clearly identify the gathering with TES. Though not tied to a denomination, most members were Baptists, holding to “Believer’s Baptism” which restricts church membership to those who are “born again” or converted and have been baptised. In February 1960, a young man named George Willows was ordained Pastor, taking up residence with his young family at ‘Wilton’ cottage, no. 34 Orchard Lane. Though his time as Pastor was comparatively brief, Mr Willows’ faith, zeal and compassion for the lost was to leave an indelible impression on the members who were to be the mainstay of the church for many decades thence. The fellowship was small and close knit, facing discouragements of low attendance and indifference from villagers. Outreach endeavours were nonetheless untiring: the women’s weekday ‘Bright Hour’ re-commenced as a Women’s Fellowship, periodic village newsletters, evangelistic Bible readings and a notable Evangelistic Campaign in summer 1962 lead by the All Nations Bible College team, from which a “6.5 Special” meeting on Thursday evenings for school age children was begun. During this time, the Mission House was converted to form a much needed vestry, kitchen and schoolroom premises on the ground floor and a small self-contained flat on the first floor, with a lounge, kitchen, bedroom and bathroom. The building work was overseen by Lt Col G. G. S. Clarke, then General Secretary of S.A.S.R.A. and it was completed in March 1962. A tenant was sought to take up residence in the flat, who would assume general caretaking responsibilities and support the work of the church. The flat and its tenants have continued to be an asset to the church up to the present day. Shortly after his third anniversary with the church, Mr Willows left Harrold to take up a new role in Lincoln. Preaching duties were taken on by lay preachers from Bedford and district. Within 18 months, a new minister was appointed and in September 1964, Mr Brian Freer was inducted to the pastorate. 1964 also marked the centenary of The Evangelisation Society, which was celebrated at Harrold with a week of special services lead by an evangelist from Torquay, Mr Paul Hill. The week’s activities included Scriptural discussion groups for teenagers and culminated in a Saturday night rally, after which a number of the congregation took the gospel message to the village’s public houses. During Mr Freer’s tenure, the ‘Friday Club’ for young children was begun, which was to touch the lives of many of the village’s older residents. It remains the Church’s main ministry for the young up to this day. Mr Freer had a particular burden for children’s work, being a teacher at Hinwick Hall and a member of the committee which published the first issue of ‘Go Teach’, the now widely used Bible teaching syllabus for children and young people. Sunday School continued on Sunday afternoons for a while, but would later be superseded by the Friday Club. Mention should also be made of Mr Marshall Shallis, who in his capacity both as general secretary of TES and itinerant evangelist, encouraged many men to enter the ministry during the 60s, including the two aforementioned Pastors. During the 70s, reformed preaching blossomed. The mentoring of Dr D. M. Lloyd-Jones inspired many men to obey the call of God on their lives to preach the Word. One such was Mr Charles Lawrence, a farmer and Methodist layman from neighbouring Northamptonshire, who was mentored and guided to Harrold by Dr Lloyd-Jones, and ordained in November 1971. The Lawrences lived at Cracknell Hill house, on the Western edge of the village, a residence purpose-built by the Northern family, on whose farm land it was sited. Mid-week meetings were usually held here, with uplifting prayer times and congregational worship. The Sunday School and Friday Club children’s work both continued. Older church members recall being blessed by powerful expository preaching under Mr Lawrence. He would attend the Minister’s Fellowship on a monthly basis at Westminster Chapel and report back, enthused about the spread of the preached word. Christian singles and couples were drawn to Harrold from near and far, the church grew and while the village was certainly aware of the work, there was no organised outreach at this time. Members would often attend the Cotswold Bible Witness Rallies in Chipping Norton and would host Preaching Rallies of their own at Harrold. After Mr Lawrence’s retirement, Harrold underwent a period of six years without a pastor. This was a period of trial for the church, with difficulties of a smaller congregation and struggle to find reliable ministry. The church was closely associated with the London Theological Seminary at this time, who would regularly send students to preach on Sunday. As time went on, the church’s prayer for a pastor became more urgent. Around 1988, a Sunday evening prayer meeting was started before the evening service, specifically to seek God for a pastor. The church still holds a prayer meeting at this time to this day. God was faithful to answer the cry of His people, and on 13th October 1990 a young man named Richard Inns was inducted to the ministry. The charge to the church was given by Mr Colin Bennett of Stony Stratford Evangelical Free Church (where Richard was previously a Deacon) and the charge to the Pastor was given by Mr Freer, then Pastor of Stapleford Baptist. Under the leadership of Mr Inns, the Friday Club was reinvigorated and the church’s reputation for working among local children and young people was enhanced. Holiday Bible Clubs for children were arranged each summer, and proved a fruitful means of establishing fresh contacts in the local area. The congregation also grew, with several young families added to the membership, and between 30 to 40 people gathered for Sunday services. Door-to-door evangelism was also begun and has continued to the present day. A full account of the Lord’s work at this time would not be complete without mention of the union with the fellowship in Carlton (see below). The history of the Carlton Baptist Meeting stretches back over three hundred years to 1688, and is detailed in a transcript which can be downloaded from the Carlton and Chellington Historical Society website. By the late twentieth century, numbers supporting the work at Carlton had steadily declined, such that in May 1991 the remaining members (some of whom also attended Harrold) with deep sadness unanimously decided to close the work. 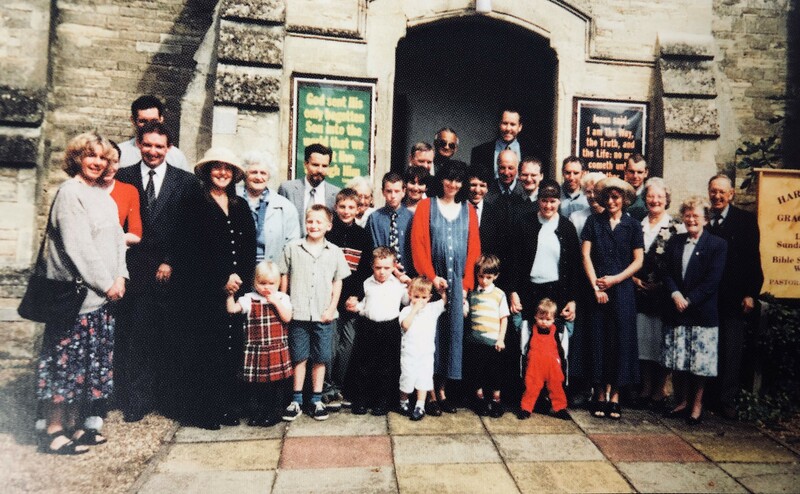 However, in God’s providence and through the oversight of other local Ministers6, in March 1992 Richard Inns was officially invited and accepted the role of Moderator for Carlton Baptist Meeting. The remaining members were accepted into dual membership at Harrold. Quarterly evangelistic meetings were begun, and the two congregations joined for worship at Carlton on the first Sunday morning of each month. 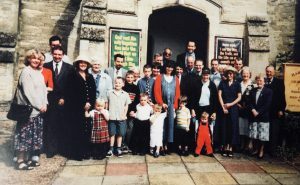 The two churches officially amalgamated in November 1993 and became part of the Association of Grace Baptist Churches (East Midlands). This union brought the benefits of a strengthened and sustained witness to the local community, and the provision of a home for the Minister and his family (e.g. the Carlton manse). In June 2002, God graciously provided another servant to continue the work at Harrold and Carlton, our current Pastor, Mr Robert Cordle. He came soon after graduating from Whitefield College of the Bible in Northern Ireland. Worship services continued largely unchanged; reverent worship, readings from the Old and New Testaments and most importantly, the sermon, an exposition of the Bible text and relevant application to the lives of the hearers. Prayer remains central to the life of the church, with a week of prayer held annually, a custom begun during Mr Inn’s tenure. Evangelism and outreach continue to be a priority, including the children’s work (Friday Club and Holiday Bible Club), Harvest Suppers, monthly services at the Broomfield Nursing Home in Olney. We have other special services and provide financial support for missionaries overseas. More recently the church started holding weekly coffee mornings, to build links with the local community. By the early 2000s, worship services at the Carlton Baptist Meeting had ceased, and the building was sold and re-developed into residential property. In 2006, to better accommodate the various activities of the church and to meet 21st century building standards, an extension was built onto the east elevation. The extension included a sideroom directly onto the Hall, a ladies, gentlemen and disabled WC and baby changing, and the old school room became the Pastor’s study. A baptistry was also added in the main Hall later that year. Previously baptisms took place either at Carlton or in the river Ouse which divides the two villages. As with many accounts of Christ’s dealings with His people, this history is a colourful testimony to His unfailing and preserving grace, as each generation has responded in faith to the gospel call. We hope it is a blessing to each reader. ¹Bedfordshire Mercury of 2nd September 1876: “A CHANGE FOR THE BETTER. 6 On 19th November 1991 Pastors Ray Simons (Providence March), Norman Foster (Over Baptist and then President of the AGBCEM) and Colin Richards (Putnoe Evangelical) met with Derek Jaye of Carlton to agree the first steps. 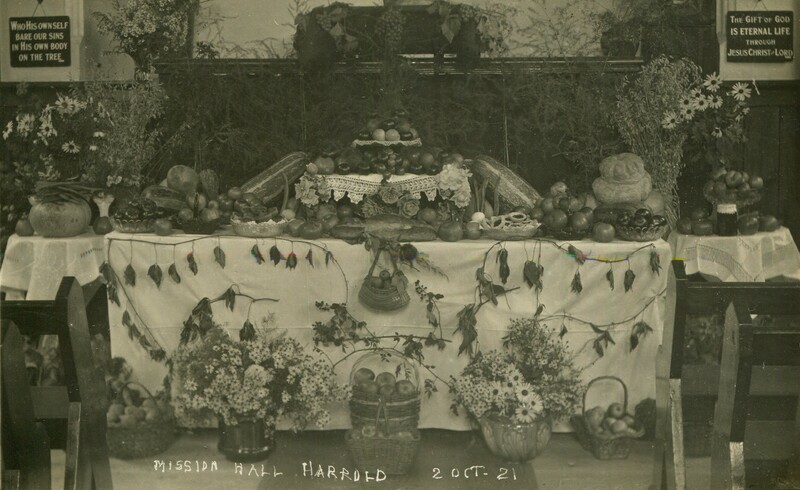 The first joint meeting of the churches of Harrold and Carlton was held a few days later.